[EDIS] Red Flag Warning in effect for portions of Los Angeles & Ventura County's from 8 pm this evening to 6 pm pst Saturday due to gusty northeast winds and very low humidity. UPDATE2012-01-27T09:20:09-08:00: RED FLAG WARNING REMAINS IN EFFECT FROM 8 PM THIS EVENING TO 6 PM PST SATURDAY. WINDS: NORTHEAST WINDS 25 TO 35 MPH WITH GUSTS TO 55 MPH DURING THE PEAK OF THE EVENT WHICH WILL OCCUR TONIGHT INTO SATURDAY MORNING. ISOLATED GUSTS OVER 60 MPH WILL BE POSSIBLE IN THE HILLS. RELATIVE HUMIDITY: LOWERING TO LESS THAN 15 PERCENT BY THIS EVENING WITH WIDESPREAD SINGLE DIGIT HUMIDITIES EXPECTED LATER TONIGHT INTO SATURDAY. IMPACTS: IF FIRE IGNITION OCCURS THERE COULD BE RAPID SPREAD OF FIRE THAT COULD LEAD TO A THREAT TO LIFE AND PROPERTY. RED FLAG WARNING MEANS THAT CRITICAL FIRE WEATHER CONDITIONS ARE EXPECTED. RED FLAG WARNING HAS BEEN ISSUED FOR PORTIONS OF LOS ANGELES AND VENTURA COUNTIES DUE TO THE PROJECTED SANTA ANA WINDS AND VERY DRY CONDITIONS. DISCUSSION: AS SURFACE HIGH PRESSURE BUILDS ACROSS THE GREAT BASIN THERE WILL BE INCREASING OFFSHORE FLOW ACROSS SOUTHERN CALIFORNIA BEGINNING FRIDAY AFTERNOON AND CONTINUING THROUGH SATURDAY. THE PEAK OF THE SANTA ANA WINDS IS EXPECTED TO OCCUR FRIDAY NIGHT INTO SATURDAY MORNING. WHEN MOUNTAIN AREAS WILL LIKELY SEE GUSTS IN THE 60 TO 70 MPH RANGE. WHILE MOST COASTAL AND VALLEY AREAS WILL RECEIVE GUSTS BETWEEN 45 AND 55 MPH. HUMIDITIES ARE GENERALLY EXPECTED TO REMAIN ABOVE CRITICAL LEVELS WITH THE ONSET OF THE NORTHEAST WINDS ON FRIDAY. HOWEVER... HUMIDITIES ARE EXPECTED TO DROP RAPIDLY FRIDAY NIGHT INTO SATURDAY. DURING THIS TIME WIDESPREAD SINGLE DIGIT HUMIDITIES ARE EXPECTED TO OCCUR ACROSS LOS ANGELES AND VENTURA COUNTIES. TIMING: RED FLAG WARNING REMAINS IN EFFECT FROM 8 PM THIS EVENING TO 6 PM PST SATURDAY FOR GUSTY NORTHEAST WINDS AND VERY LOW RELATIVE HUMIDITY FOR THE MOUNTAINS OF LOS ANGELES AND VENTURA COUNTIES. WINDS: NORTHEAST WINDS 25 TO 45 MPH WITH GUSTS TO 65 MPH DURING THE PEAK OF THE EVENT WHICH WILL OCCUR TONIGHT INTO SATURDAY MORNING. A RED FLAG WARNING MEANS THAT CRITICAL FIRE WEATHER CONDITIONS ARE EXPECTED. THIS IN COMBINATION WITH SUFFICIENTLY DRY FUELS COULD CREATE EXTREME FIRE DANGER AND/OR FIRE BEHAVIOR. 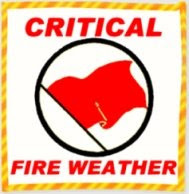 PLEASE ADVISE THE APPROPRIATE OFFICIALS OR FIRE CREWS IN THE FIELD OF THIS RED FLAG WARNING.